It’s a great deal in life when one of your favorite people turns out to be someone you get to work with from time-to-time. Richard Beck is one of those guys for me. We were colleagues at Abilene Christian University for eight years and were a part of a group that met every Friday for refreshments and conversation. We became great friends. At that point, Richard didn’t have a blog, he hadn’t written books, and he was still figuring out what the theological options were. Now, he’s got the most interesting blog around, has written a few books, and has turned into a more than respectable theologian. His stuff is insightful, creative, and usable. We’ve had him at Streaming before, and as his students will affirm, he is an outstanding presenter. 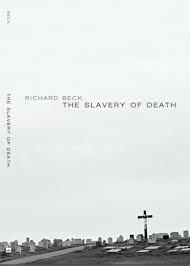 He will be bringing material related to his new book, The Slavery of Death. He just sent me titles and descriptions for his presentations. You need to be at Streaming. In Hebrews 2.14-15 fear, our fear of death in particular, is described as “the power of the devil.” The talk will trace this fear to our worries about what Brene Brown has called “the shame-based fear of being ordinary” and how this fear and shame cripples our ability to love each other fully, authentically, and sacrificially. “Perfect love casts out fear.” But how is this “exorcism.” this “casting out” accomplished? The talk will argue that a critical aspect of this process involves confronting the ways in which our identities have been idolatrously constructed, making us vulnerable to the shaming we experience in weakness, need and failure. However, in the practices of worship, prayer and thanksgiving our identities can be “hidden in Christ.” Now found in Christ, and outside the dominion of death and the devil, we are set free from fear and shame creating the capacity to step into lives of love and servanthood. This entry was posted in Uncategorized and tagged experimental theology, Greg Boyd, hermeneutics, missional theology, Richard Beck, Streaming, the cross, theology. Bookmark the permalink. To describe something as complex as love, language is limiting. If you think you have a description, you’ve probably missed it. It’s best described as it’s been described here by pointing out what it is not. If Love is our true nature, we don’t have to go out and get, find, or learn love. We need to remove what it is not. Identifying with the mind made self as “who we are” is out of fear of being ordinary, unacceptable, or not good enough. Still, my favorite post of yours is “Idolatry and Grace” which points to this truth as best as I’ve read or heard. Thank you, Mark!